Back row: Florent, Blake, Antonio, Mark, Orlando, Dan, Kinchem, Anthony, Rayna, Brendon, ___, Stu. note – apologies for the two forgotten names! 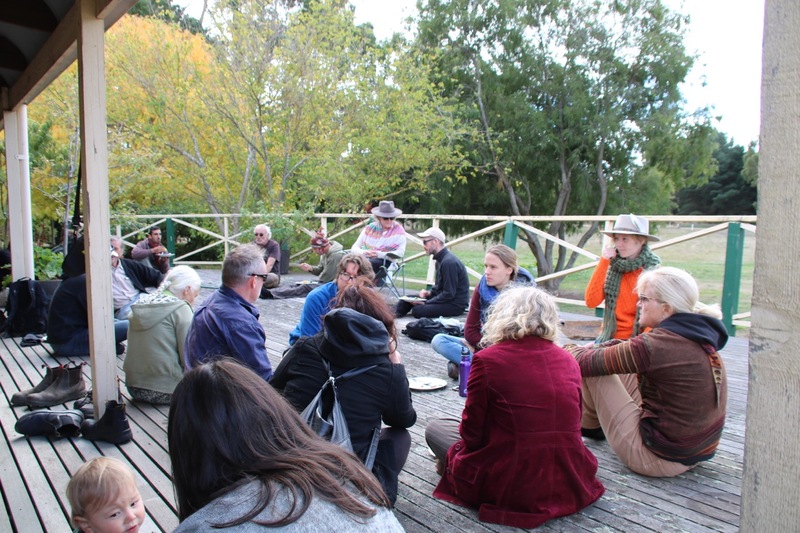 We started the day with an open discussion, where everyone had the chance to share where they were at and heading with their own projects, and their reflections on permaculture. Participants were involved in a really interesting range of projects. I picked up on an eagerness to break permaculture out of the confines of being a landscape-focused discipline. To apply it elsewhere. In retrospect, this resonates with the talk I hear about the need for a social permaculture, a spiritual permaculture, a permaculture economics, and so on. 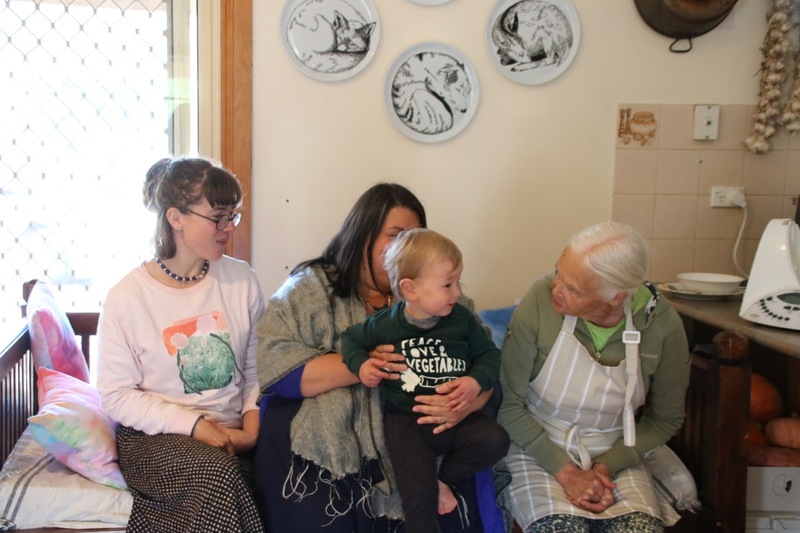 Indeed, if permaculture has a sound, coherent and comprehensive system for effecting lasting change, it only follows that our focus ought to be pushing it out far and wide, right? 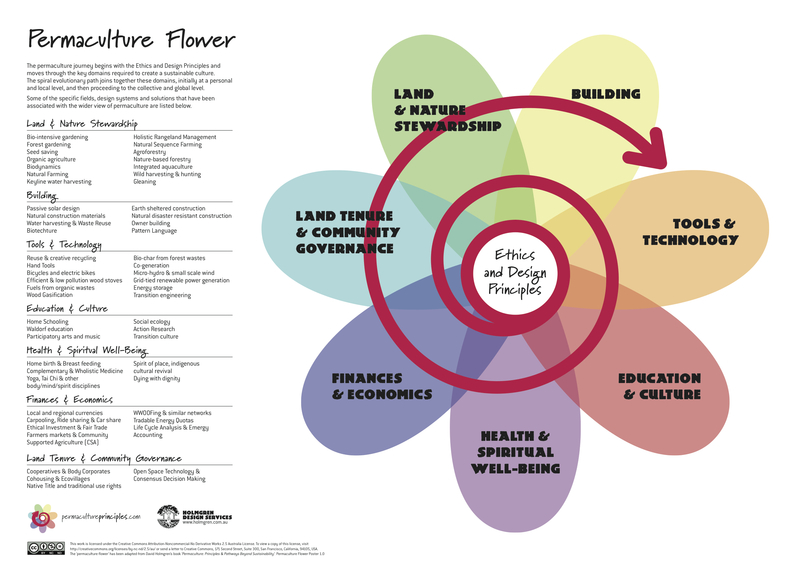 I shared a concern with this idea: My opinion that the design process at the core of permaculture currently lacks soundness and coherence. As a result, in spreading permaculture (which is above all else a design system), we are unintentionally spreading ideas that are unsound and incoherent. Ideas that will, if inadvertently, undermine the ability of permaculture to deliver real solutions in different domains. To deliver on its incredible promise. Yes, let us spread permaculture more widely. But let us also get on the same page about the core of the ideas we are spreading. Let us then deepen the quality and coherence of those ideas. Indeed, this deepening work can only benefit from happening in a wide diversity of contexts: places, cultures, domains, and disciplines. Breadth, yes. 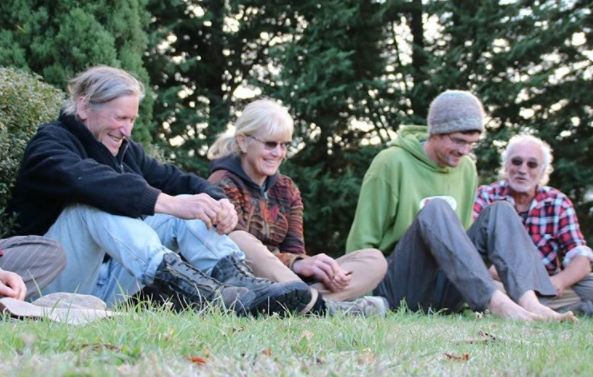 A broad range of amazing people doing permaculture in a broad range of contexts. Great! But not at the expense of depth. Later in the day we had reason to pick up on this theme. 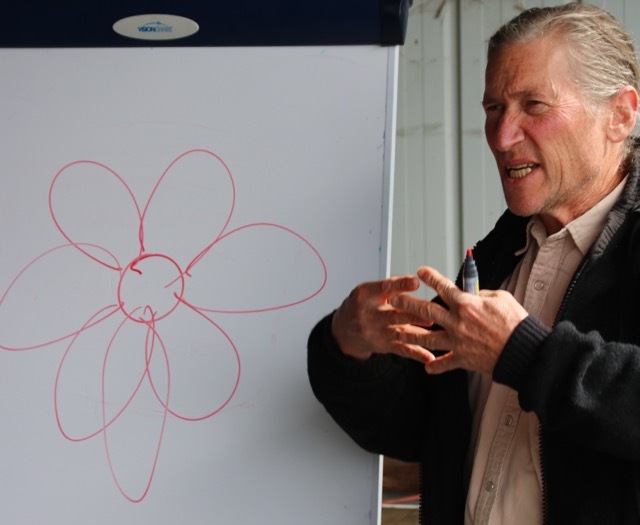 Here David shared how he makes sense of this issue in the context of his permaculture flower. Here, the red line spiralling out represents design process. Arising from ethics and principles, it cycles through all the seven domains. David pointed out that all of us are involved in all seven domains. Indeed, it is probably fair to say that not a day goes by when all of us don’t have something to do with all seven. This gives us all the opportunity to deepen our own practical, lived experience of the design processes we all use, every day, in the context of these inseparably related aspects of our lives. The resulting process understandings will be deep enough, general enough, to serve us wherever we go with permaculture. Rather than developing only domain-specific tools or taking some process we perceive others as having developed in one domain and then seeking to copy and paste it sideways, let’s develop a shared vocabulary of design process at a deeper level. Then let’s share (and continue developing) that, not to mention joyously beholding the unique and beautiful solutions it generates in different domains. After morning tea we packed up our tents and things and car-pooled our merry way to the Mayberry Woodend project, where I’ve been acting as a design process facilitator with Anna, LJ, Tom, Menno (big people) & Ren & Rhys (little people). I was excited to be able to share a real example of the process approach we’d been exploring on the course. It was also great to explore a living-scape (as in both people and place, together)3 that, in contrast to Melliodora, was just beginning its development journey. The starting state of the landscape was still easy to make out amongst the fresh earthworks and just-planted trees. One of the most striking examples of the nature of the design (and creation) process at play at Mayberry concerns the driveway in relation to human feeling.4 As a group we walked into the property via the old driveway. 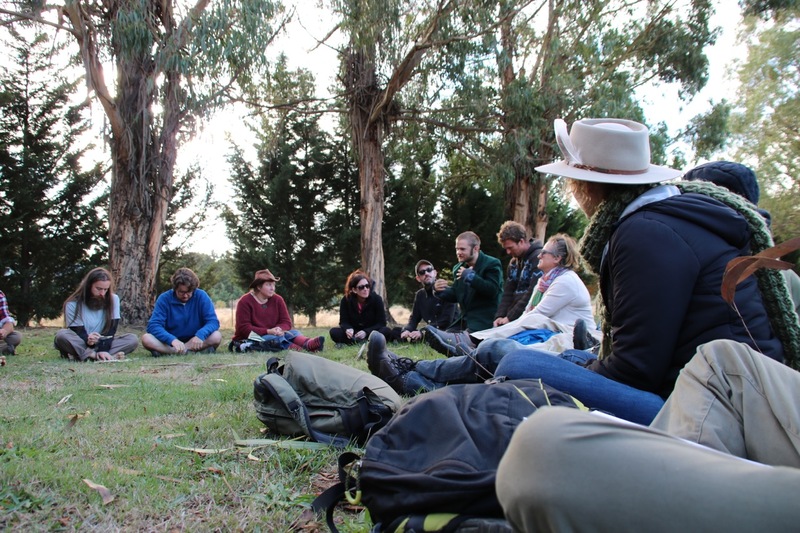 I asked participants to verbalise how they felt as we approached the homestead – to articulate their feelings. There were about ten aspects of the driveway which made folk feel tense as they imagined driving in that way. One was the feeling of being thrust straight into the private area behind the houses – a feeling of suddenly entering an intimate space prematurely. Another was the feeling of confusion about where to park. 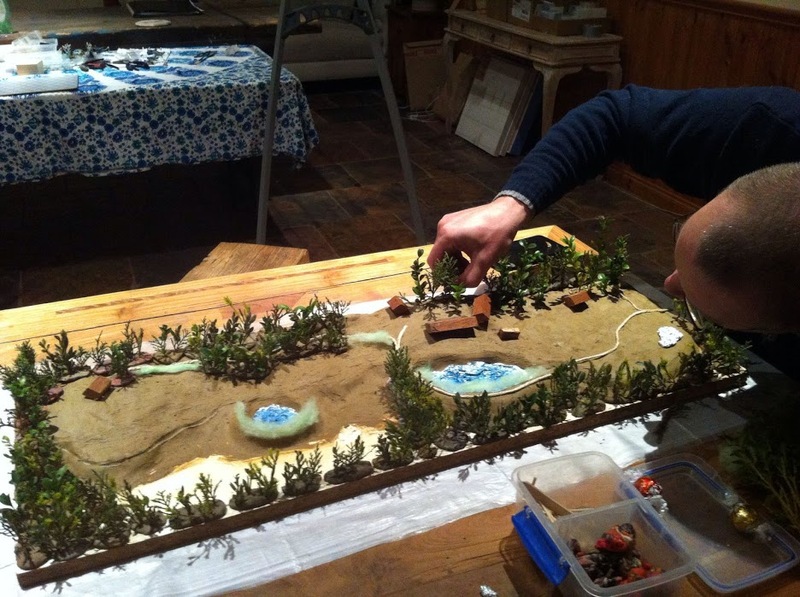 But before these, David articulated another aspect of how the layout of the old driveway induced felt tension. One that I hadn’t consciously noticed before. One side of the driveway was flanked by a cypress hedge that on the one hand was dense, but on the other had regions of partial visibility where you could make out the neighbour’s house and activity. This created a subtle feeling of sort of seeing into their space inappropriately, like the idea was you shouldn’t be able to. 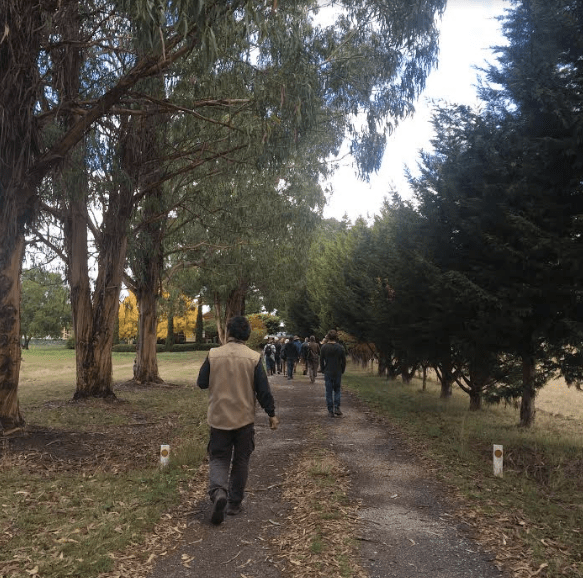 But perhaps even more significantly, tension was induced by the fact that the other side of the driveway was wide open (apart from the trunks of several large eucalyptus trees5 This gave a feeling of asymmetry that was distinctly uncomfortable when you paid it attention. The new driveway you can see in the above photo or drone footage completely resolved and dissolved all the tensions induced by the old driveway, not to mention helping resolve other tensions on the property such as inadequate water diversion into the main dam and the feeling that the dam was unconnected to the rest of the property. 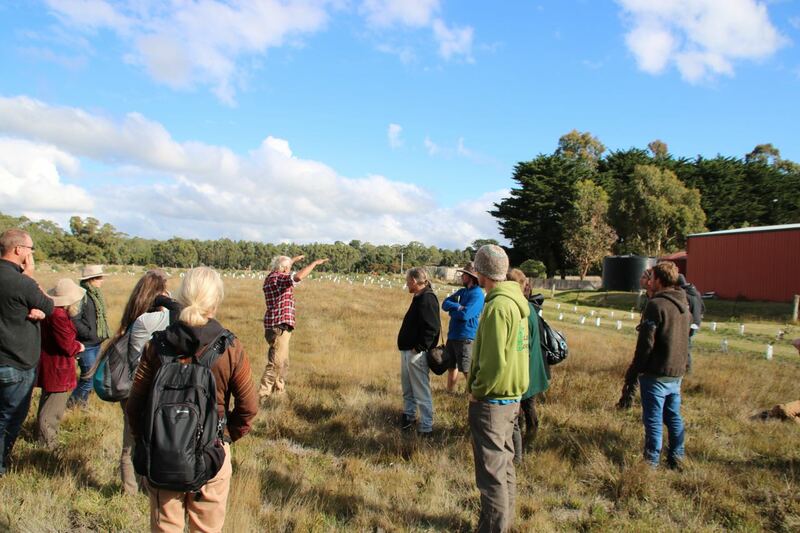 Wandering around aside, the best bit of the visit for me was having the four lovely clients6 sharing the experience of the process from their end, along with tree planting contractor David Griffiths sharing his experience of being part of the process. These words were so very true of our visit, and I’m so grateful to LJ, Anna, Tom and Menno for so warmly taking us all into their home and sharing so openly and honestly what they are up to. There was one aspect of the visit I hadn’t really thought about until we arrived. 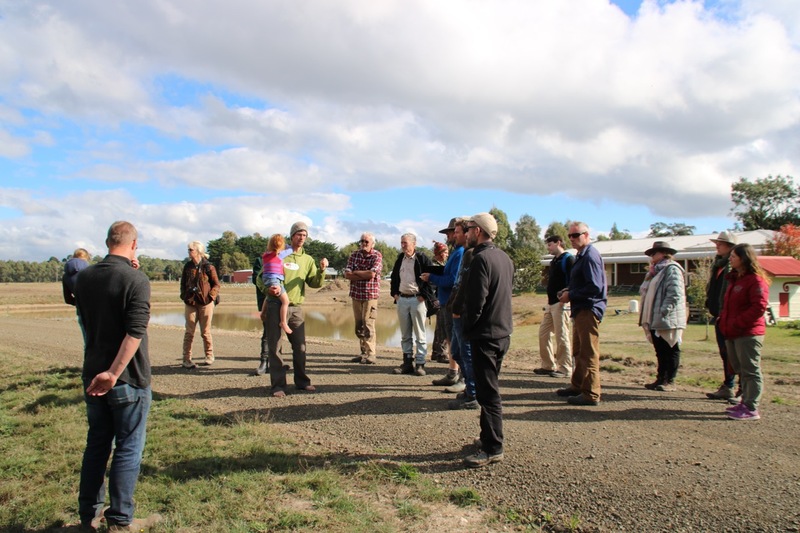 David Holmgren was visiting the site of a significant design project I am involved in! It is one thing to talk about design process, but another to share with a senior colleague how what you’re talking about actually pans out in reality. It is another thing again when that senior colleague happens to have co-originated the very field you are working within! So when David pulled me aside to share his reflections on the project, I suddenly felt rather nervous. Was he about to point out some major oversights, mistakes, wrong turns? Was he about to suggest that what was underway at Mayberry had no relation to the design process understandings I’d been sharing on the course? Was I about to find myself humiliated in the presence of the mentor? The day and thus the course ended at Mayberry. We found a sheltered spot and, sitting in a circle, each shared reflections on the experience and where we were each heading from here. In this moment of lovely vibes, I was delighted to hear that participants felt as if they had been part of a conversation. For me at least, this made the whole experience real, made it exciting. Neither David nor I or anyone else knew what was going to happen, where we were going to end up. 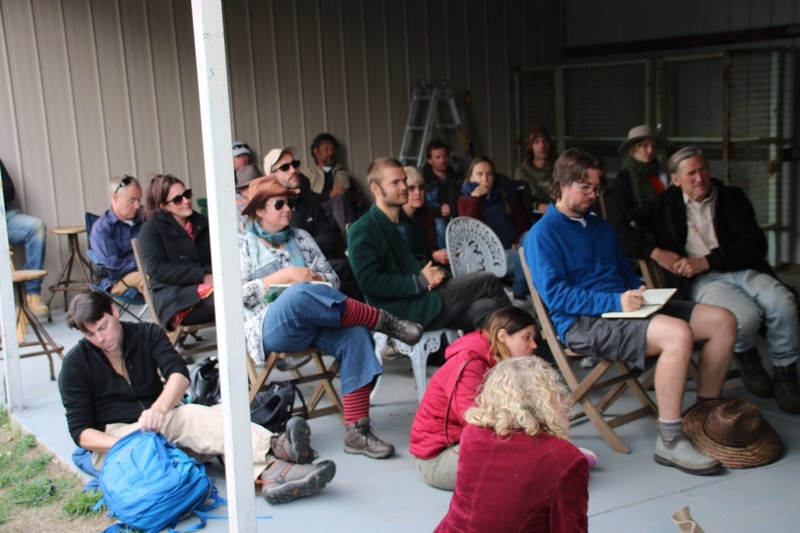 One thing I shared was my experience of the whole thing being an eight-day intensive inquiry into permaculture design process. Consisting initially in dialogue between David and myself for the first four days and then with a lovely larger group for the second four days.8 I was feeling extremely grateful that the thing had happened. Here, again, is the post-course reflection conversation David and I had a few days after the course. On the proverbial scale of 1-10, how much value do you feel you received from the workshop / how useful will what you learned (from everyone) be in your future? The average rating here was 9/10. If someone considering this workshop in future asked you about it, what would you say to them? Get plenty of rest before you start – I’m exhausted! Do it! This course reaffirms and gives permission to take action. Really deep provoking course with challenging concepts. Great holistic design process. Lots to think about! Absolutely recommend if you wish to extend your permaculture design skills, especially if the design process hasn’t sat all that well with you. You will come away inspired and enthusiastic. Yes definitely. 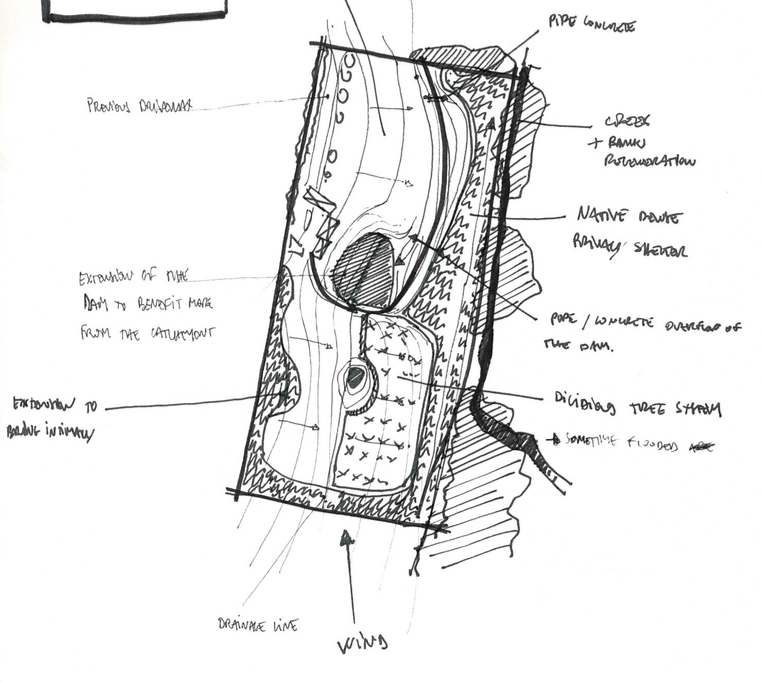 Its a good complement to a PDC, or for someone designing properties. 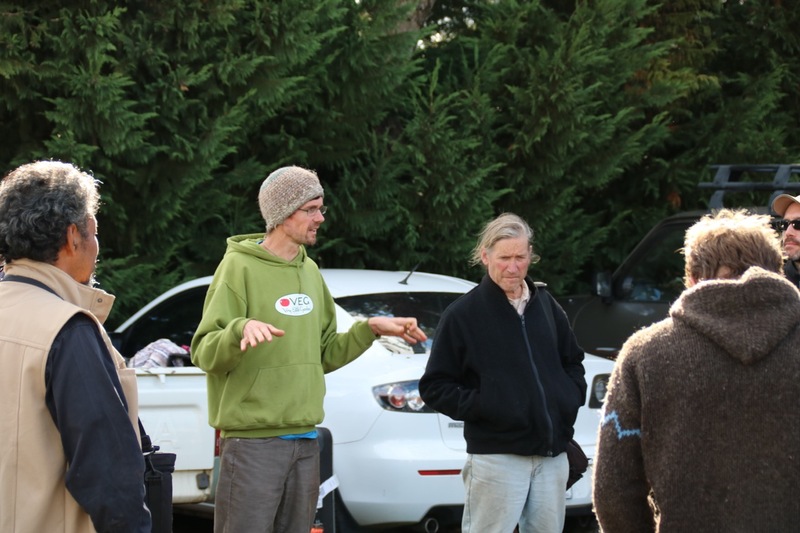 If you’re serious about applying permaculture on projects or more broadly , you shouldn’t hesitate to do this course. It was a game-changer for me. Oh yes, one of the participants, Seb, also wrote a few words of post course reflection here. 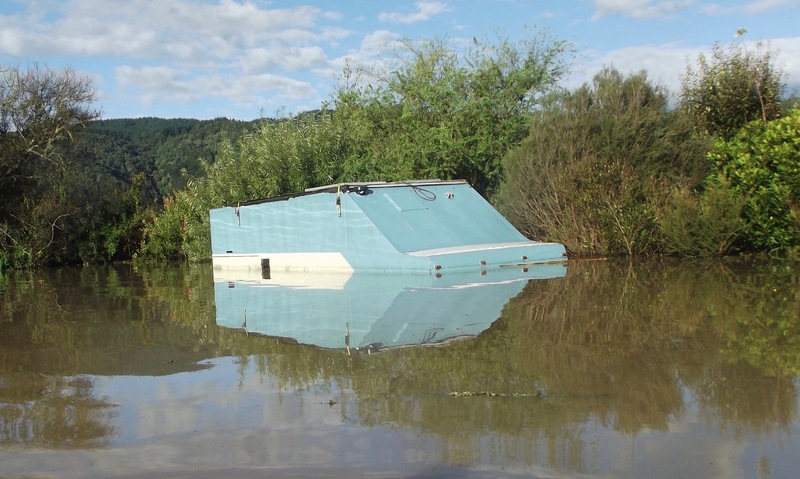 Several days before the course a friend in New Zealand let us know that my parent’s seven acre property had been seriously flooded. Here’s a photo of our two-story 1964 Bedford house bus at the peak of the flood. Yikes! For a day or two I considered pulling out of the course to return to NZ to help with damage control. 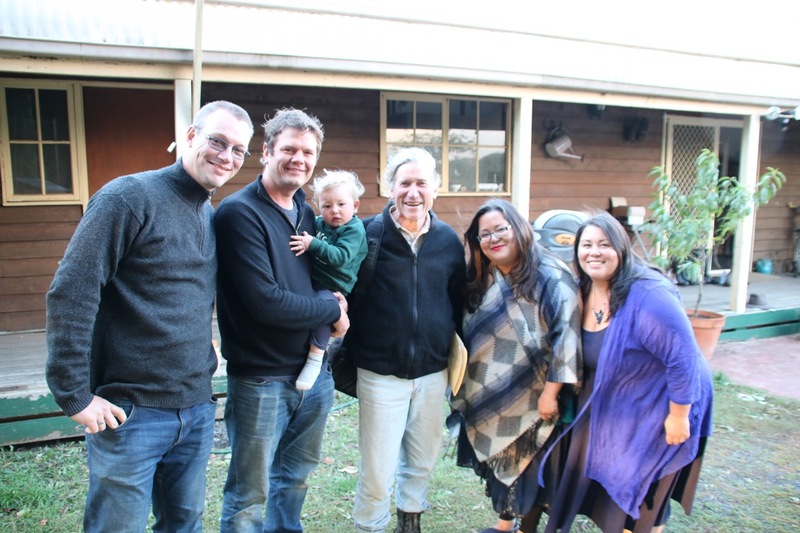 It was the incredible group of friends in NZ, organised by Louise Shaw & family, that made my decision to stay possible. During the actual workshop they put in days and days of work not only helping my mum and dad with the first round of cleanup (with a house and barn also under water) but retrieving, washing and drying my family’s possessions (we had only just arrived back in Australia to live). Gratitude to all of you! Now there is another reason I mention this. For almost my entire permaculture library got destroyed. A permaculture book compost pile was started.10 This included Volumes 1, 3 & 4 of Christopher Alexander’s The Nature of Order series. Volume 2, The Phenomenon of Creating Life, I had brought with me, along with The Timeless Way of Building, The Pattern Language, and The Battle for the Life and Beauty of the Earth. These, at least, were saved. I mention this because during the closing circle David gifted them to me. This was a moment I’ll long remember. 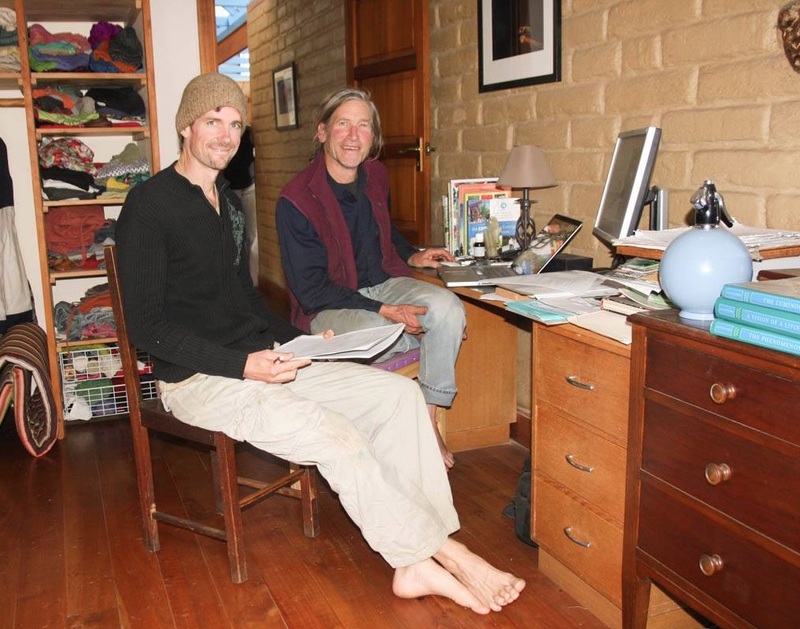 David Holmgren, a significant mentor and the co-founder of permaculture, gifting me three of the four Christopher Alexander volumes I am drawing on extensively to critically advance permaculture. Two of my favourite worlds coming together. What had happened was that, in some part due to my going on about them, David had purchased the volumes. But given how much he has going on, he realised it was unlikely he would ever manage to read all four. He had volume two yet to arrive, so figured he’d gift me the other three and just read volume two, which I obviously thought the most important, given that was the one I had chosen to bring back with me. So, that is that. Course review done. Tick. If anyone happens to find themselves interested in future iterations of this course then please check out the Holmgren Design Services website, where they will be listed. Given we had ourselves a fine time, David and I anticipate running the event again on something like an annual basis. 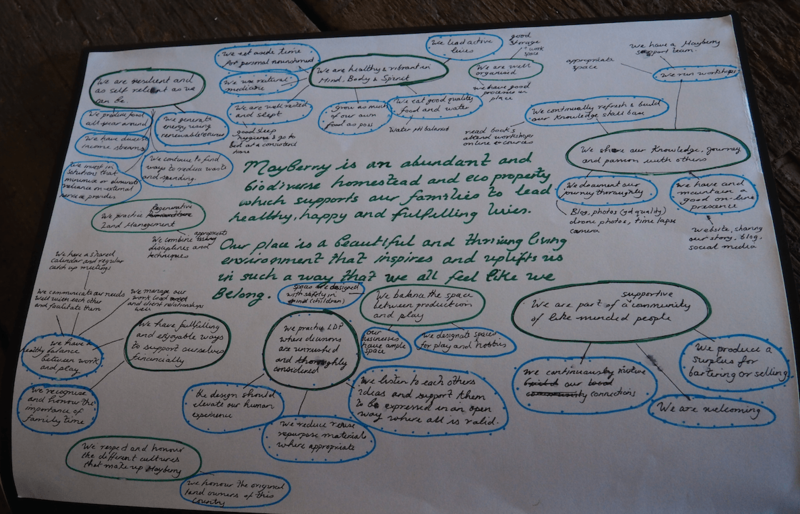 Thanks for reading, and in the coming posts I look forward to getting on with our current inquiry into the relation between designing and implementing inside permaculture design process. ps. Please do leave a comment – would love to hear what you made of this event report and whether is something you’d find useful in future. I thank Anthony Briggs for this feedback on a draft of this post which prompted me to add these next three paragraphs: “One thing that I remember which had a very strong impact on me was our walk up the driveway, trying to tune into how a place makes you feel rather than (exclusively) using an analytical mindset. It seems to me to be one of the main reasons to use Christopher Alexander’s (and your) design process, so maybe you might want to add a bit more about that part? which were themselves tension-inducing if you knew anything about bushfire risk in the area! I will say this much though: the project got off rather lightly ;-) He would have made a few different species selections, and as he arrived he tuned immediately into the fact that strong winds from the south and bitterly cold frosts were major limiting factors on this site. But he appreciated the overall layout and in particular the extent to which the clients were fully 100% involved in every step of the design process. Despite having mixed feelings about sharing the feedback. One reason is that I don’t want to create any perception that this writeup is either an exercise in personal ego-stroking or in marketing future courses. 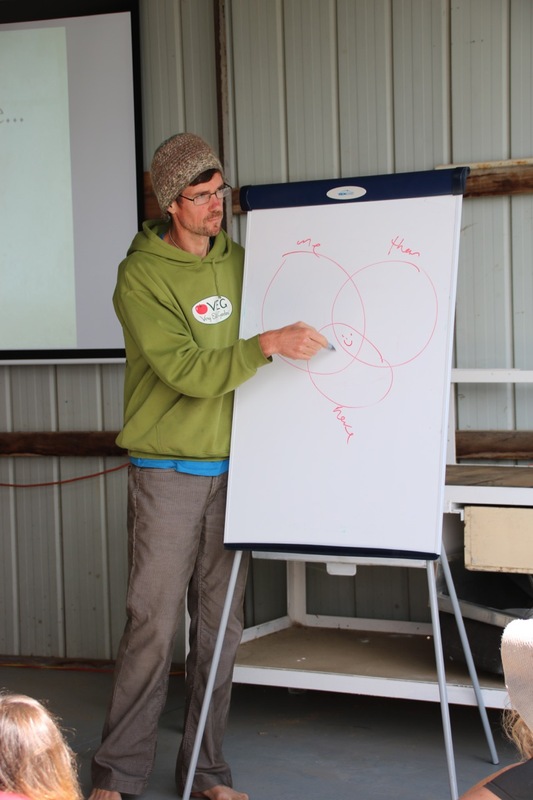 For it isn’t (As you might expect, advanced permaculture courses with one of the co-originators don’t really need marketing!). 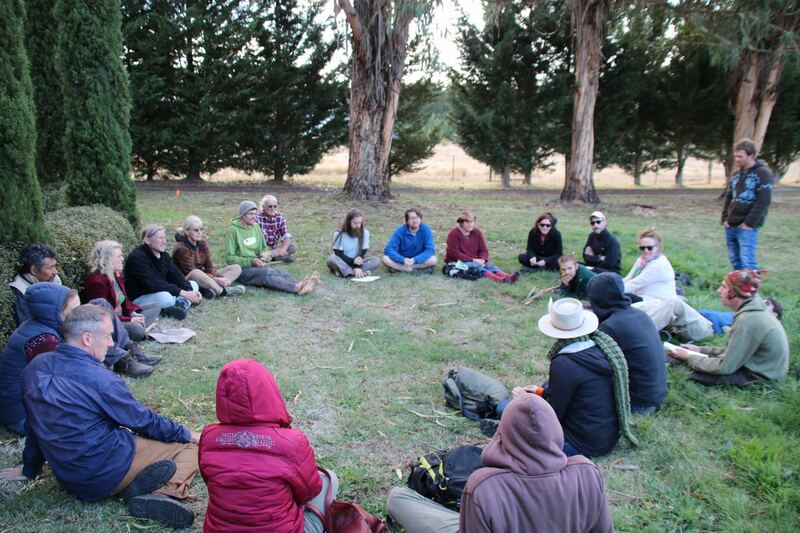 It is about sharing one of the richest experiences I have had in the space of making permaculture stronger. An experience that for me both grew out of this project and will feed back into it.